I first encountered author Martin Roy Hill when I was scrolling through the Kindle listings for the alternate history genre, and encountered a short story titled Hitler is Coming; unlike the majority of the indie AH titles to be found, this one had a good piece of cover art that drew the eye, and an intriguing back cover blurb that sounded interesting despite the standard AH trope of a Nazi victory during World War II. Downloading it, I quickly discovered that Hitler is Coming was an engaging and imaginative exercise in alternate history that was also something of a rarity in the world of counterfactual fiction; it actually managed to make the ‘Nazi Victory’ scenario interesting and freshen up an extremely stale trope. More recently, I reviewed another of his short stories, The Last President, which turned out to be an engaging, thoughtful and worryingly realistic piece of speculative fiction that looked forward in time to a corporate dystopia that had abolished the rule of democratic government in the United States of America. I knew that Mr Hill had written a number of other titles and had them on my long-list of books to read, and so it was good timing for the author himself to contact me to see if I’d like to review his latest book, due to be released in January 2019. Polar Melt certainly sounded something I’d be interested in reading even if I hadn’t been sent an ARC – the back-cover blurb delivered increasingly-irresistible hints towards something that merged my love of action-adventure tales with something much more insidious and perhaps even Lovecraftian in nature. A missing research ship that turns up, Marie Celeste-like, with no crew and rigged to explode; a fight between old Cold War rivals over a strange new source of energy; and, below the ocean and connected it to all, an object, waiting patiently. Put that all together with another good-quality piece of cover art that draws in the eye, and I was looking forward to seeing what Polar Melt would deliver. Hill starts the novel at a whip-neck pace, and that’s something that barely lets up throughout the entire book, pulling you along in its wake. The US Research Vessel Franklin goes silent during a mission, and after several days she’s finally located; but instead of the Navy being sent in to secure the vessel and crew, instead a small band of special forces operatives are deployed to investigate. I think that’s an unavoidable trope in the genre, but Hill makes sure it doesn’t turn stale or become boring by having the team actually be from an elite and little-known section of the US Coastguard; I appreciated the different direction that Hill took, and also the spotlight being shone on the less-famous branch of the US armed forces, which made the plot rather more memorable than the usual genre potboilers. Once onboard the Franklin, it quickly becomes apparent that the crew have disappeared, shortly after the crew of their own research submersible had also disappeared after coming back from patrol. It’s a mystery, but Hill makes it clear that DSF-Papa is comprised of individuals more than qualified to find out what happened to the vessel; they’re all veterans, highly trained, heavily armed, and at least one has had prior experience with unexplained phenomena. Taking that in, I’m once again struck by Hills ability to take a tired trope of the genre and breathe fresh life into it: the team members of DSF-Papa come across as entirely believable and fleshed-out characters, not the genre-standard cardboard cutouts that you instinctively know are going to die in a few pages and therefore don’t need to get attached to at all. They’re obviously a team that’s worked together for some time, sparking off each other and generally displaying a subtle camaraderie that Hill deftly illustrates. Hill then introduces a new factor by bringing in a CIVMAR team – civilian experts hired by the US Navy to assist with crewing naval support vessels and other ships. The rigid military discipline of DSF-Papa is then nicely contrasted with the more relaxed and informal nature of the CIVMAR crew, generating a little tension while also bringing in more potential victims to the Franklin. Then, once everyone has arrived, Hill starts to crank up the pressure and integrate new plot points – trying to get the Franklin moving, the crew discover several sets of plastic explosives set to sink the vessel; this results in a nicely tense sequence where they try and remove the explosives, hampered by the added complexity of the sub-zero temperatures freezing the liquid in the triggers. It was about a quarter of the way through Polar Melt that I came to notice just how authentic the entire adventure felt to me, especially as a neophyte in regards to naval technology and the effects of climate change. Everything that happened in the novel – from the actions of DSF-Papa and their CIVMAR counterparts, to the design and layout of the Franklin, and the descriptions of the polar region itself – had a real air of authenticity that brings everything to life, and also acts as a firm base for the more inhuman elements in the plot that turn up later in the novel. All of this is obviously the result of Mr Hill doing a significant amount of research, and then distilling all of that into a writing process that created such an engaging novel. It’s an impressive accomplishment, particularly when there are so many authors have quite obviously done the bare minimum of research before writing a similar tale. A missing crew, an abandoned vessel, and defused explosives are only the tip of the metaphorical iceberg for DSF-Papa and their civilian colleagues. Their neighbours, one of the gigantic Russian oil refineries operated in the area now that the titular polar melt has revealed more minerals and resources such to access, are suffering continual technical difficulties and mysterious equipment failures, and even a fatality from an electrical discharge that shouldn’t have been able to occur. Something is obviously wrong in the region, and it isn’t long before its secrets are revealed and that almost nothing is what it initially seems to be. As the plot moves forward, Hill effortlessly generates a real air of mystery around the Franklin and its crew, which in turn contributes to the overall tense and suspicious atmosphere that begins to form as attention turns to the Russian oil rig and the exact nature of what it’s trying to uncover in this remote polar region. His descriptive writing is amazing as well, easily putting across the simultaneous beauty and danger to be found in the Arctic scenery; in particular, there’s a sequence where a submersible goes underwater that is sublimely written, Hill evoking the cold, alien majesty of travelling in such cold and deep waters. That submersible scene also leads into a fantastic action sequence, as the Americans stumble across a secret that the Russians will kill to protect; there’s some real adrenaline-rush writing by Hill as mini-subs suddenly clash together in a region of the planet where the slightest damage could see a crew simultaneously drowned and crushed by the immense pressure of the deep ocean. I mentioned earlier in the review that all of the characters in Polar Melt felt well-developed and interesting, and by far the most interesting is the commanding officer of DSF-Papa, Commander Gates. Hill establishes early on that Gates is a veteran Coast Guard officer, but also that he’s known for a certain sixth sense, something that alerts him to danger just before it actually happens. I liked that idea, especially as Hill embeds that notion in the story through a flashback to Gates’ earlier career in Iraq; I had no idea that a significant element of the invasion of Iraq had been capturing and protecting off-shore oil platforms, nor how perilously thin their protection was by US forces once they’d been taken. It’s a fascinating and little-known subject that Hill highlights admirably, while also using it to demonstrate Gates’ sixth sense – it turns out that, despite desperately wishing he didn’t, Gates is occasionally visited by the spectre of the legendary Flying Dutchman; the mythical ship appears off an oil platform in Iraq to warn him of an attack, and the Dutchman also comes to Gates in the Arctic. Here Hill once again demonstrates his creativity as a writer, creating a chilling and quietly disturbing scenario that haunts Gates, yet proves invaluable in surviving the treachery and death that surrounds the mystery of the Franklin and it’s missing crew. 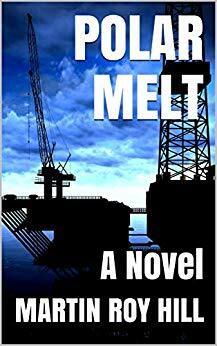 As with most of my reviews, I try and avoid spoiling any major plot points, particularly the ending chapters of a novel, so I won’t be going into the climax of Polar Melt in any detail. However, I will mention that it’s a thrilling and pulse-pounding finale that merges together high-tech naval action with an intriguing blend of oceanic mythology and conspiracy theories, as the US Navy desperately attempt to disrupt the Russian plans to capture and utilise the mysterious object that’s been discovered under the Arctic waters. It’s highly engaging and hugely enjoyable, and leaves a number of questions unanswered about the entire scenario that I’d like to see explored in a sequel. Taken all together, Polar Melt is another brilliant accomplishment by Martin Roy Hill, once again demonstrating his undeniable skill as a writer; excellent writing, a highly imaginative and exciting plot, and gripping nautical action sequences all merge together to create a first-rate military action thriller that’s a sure-fire hit.